Final-year Bachelor and Master of Engineering students have honed their presentation skills and gained invaluable industry feedback on their thesis projects at the Australian Maritime College’s Maritime Engineering Research Conference. The annual conference marks the culmination of countless hours of hard work during the last year of their maritime engineering degrees, with students required to deliver a 15-minute presentation and 5-minute Q&A session which is judged by industry assessors. A total of 85 presentations were delivered to the panel of external assessors, the majority of whom travelled from interstate to attend the conference. Bachelor of Engineering (Ocean Engineering) student Eric Gubesch was awarded the best presentation prize for his research integrating multiple wave energy converters into a multi-purpose floating platform. “The concept involved developing a floating structure that could be used for a variety of purposes and uses the motions of the platform to generate energy,” Mr Gubesch said. “The platform integrated four wave energy converters (called oscillating water columns) into a rectangular structure and could potentially be used in the offshore aquaculture industry or in applications where an isolated floating structure requires a source of energy. 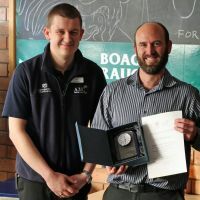 Mr Gubesch won a trophy from the Royal Institution of Naval Architects (Tasmanian Section) and $250 from the Australian Maritime Safety Authority (AMSA) for his efforts. Runners-up Samuel Smith and Yew Kee Goh each received $125 from AMSA for their research on strength analysis of corroded aluminium structures and analysing AUV area coverage planning respectively. Upon graduation, Mr Gubesch plans to build a career contributing to the development and application of marine renewable energy. His aspirations include completing a PhD in the field and sharing this knowledge with students and the global research community. “I enjoy the pursuit of solving challenging problems with innovative solutions and the marine renewable industry requires exactly that,” he said. Associate Professor Gregor Macfarlane said the quality of the presentations was a testament to the students’ efforts throughout the course of their degrees. “The Maritime Engineering Research Conference was an excellent experience for both students and staff. It provides students with the opportunity to build their presentation skills in front of a relevant audience, as well as highlighting some of AMC’s current research focus,” he said. For Mr Gubesch, the conference capped off a rewarding study experience at AMC, the highlight of which has been conducting experiments in hands-on facilities such as the model test basin. “I have learned so much from applying theoretical concepts learned in the classroom to the real world in the model test basin and other AMC facilities,” he said. “I have had the opportunity to design a range of floating (and other) structures from first principles, construct them in the build studio, conduct scale model experiments, and then evaluate and compare the performance to my initial design. This learning cycle has been invaluable.